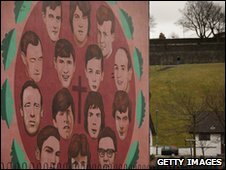 The final word on what really happened on 30 January 1972 - Bloody Sunday - will wait until the long-awaited report on the Saville inquiry is published. But ever since the day when British soldiers opened fire on protesters in Londonderry, killing 14, there have been claims that the Army deliberately misled those investigating the tragedy. These have continued despite firm denials of any attempt to deceive by a senior army officer at the Bloody Sunday inquiry. Yet, as Radio 4's Document programme reports, there have long been claims that elements in the Army and British government were behind a widespread propaganda campaign throughout the early 1970s - mostly aimed at undermining the IRA. Stories they are alleged to have spun to the press ranged from falsely linking the Provisionals to a deadly loyalist pub bombing to others involving Soviet submarines, black magic, Czech snipers and even exploding women's underwear. 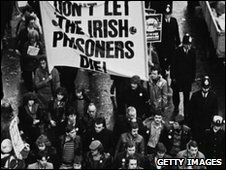 The introduction of internment in Northern Ireland in August 1971 in response to growing violence from the IRA had backfired. 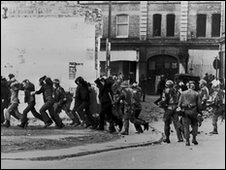 The violence got even worse and British forces found themselves losing the battle for public opinion. Concerned that the IRA was using the policy to further its propaganda war, London decided to fight back. It set up what was known as the Information Policy Unit, or IPU, at the Army's headquarters in Lisburn. Its job was to discredit the IRA wherever possible, often by holding special briefings with journalists. This was joined soon after by another group, the Information Research Department or IRD, a behind-the-scenes branch of the Foreign Office created in 1948 to counter communism. Both groups were now to engage in a full-blown propaganda war against the IRA and some other paramilitaries. In December 1971, a month before Bloody Sunday, an explosion ripped apart McGurk's Bar, a Catholic pub in Belfast - killing 15 people and wounding 17 more. The Army and police claimed to have found evidence that the bomb that caused the blast had gone off inside the bar. Given that McGurk's was a Catholic bar, this implied that it must have been an IRA device that went off accidentally. Forensic evidence later proved that the bomb had clearly been placed outside the pub. Finally, seven years later, the loyalist Ulster Volunteer Force was convicted of the attack. 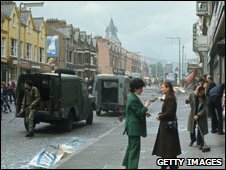 Claims made by the Army directly following the events on Bloody Sunday fuelled suspicions of attempts to mislead investigators here at the BBC. Appearing on Radio 4's Today programme on 31 January 1972, army spokesman Col Maurice Tugwell insisted there was evidence that some of those who died were far from innocent bystanders. "One of the dead men was found in a car that had been taken out of the town and he had four nail-bombs in his pockets, and of the others who are dead in the hospital preliminary investigations show that four of them at least are on the wanted list," Col Tugwell said. He later admitted to the Bloody Sunday inquiry that some of what he had said contained "mistakes" and "errors". But this, he claimed, was the result of inaccurate information he had received at the time - and not down to any deliberate attempt to deceive. However, critics have pointed to the fact that he was a leading figure in the propaganda war being waged from the army's Lisburn headquarters. In August 1972, Prime Minister Edward Health gave his backing to the covert war. A letter written by Principal Private Secretary Robert Armstrong to the Home Office stated: "The discrediting of the IRA will require the immediate injection of a considerable number of additional staff. The prime minister would like to see the place flooded with them, taken from Whitehall, the Central Office of Information or wherever available; and above all we should get hold of those who are experienced in psychological warfare and give them their head." From this point on, Britain's propaganda war entered a new phase. Stories spun to journalists became ever more outlandish and even comical. Take the following story which appeared in the News of the World that same year, headlined: "Russia in IRA plot sensation." It read: "Intelligence agents have discovered that the Russian Government is directly involved in the supply of rocket launchers and other arms to the IRA. "A sinister dossier of evidence includes: MYSTERY landings by men in Eire from a submarine; SIGHTING of a Soviet tanker and submarine close to the coast in suspicious circumstances; An OCTOBER visit to Dublin by a notorious Kremlin agent; ACTIVITIES of a one-eyed American in the city." A man in the thick of it all was Colin Wallace, an IPU army press officer based at the Lisburn HQ, who admits to having spun - if not entirely created - many of the stories passed to journalists. A highly controversial figure, he remembers spreading "news" that both IRA and loyalist paramilitaries had become involved in witchcraft and black magic. He even went as far as planting "black altars" in certain areas and going to great lengths to get the "props" that went with them. "We used to collect chicken blood from the cook house at the army barracks and put that on the altars so it looked like there had been a sacrifice or something," he says. "It was made to look really horrible." The IRA didn't take all this lying down - and came up with its own spin on events. But Sinn Fein's former director of publicity Danny Morrison says some stories were so ridiculous they thought few would believe them anyway. He claims to remember one in particular "that the IRA had hired in a thousand-pounds-per-shot Czechoslovakian sniper". Mr Morrison recalls: "And the way he worked was that if a young soldier was walking through Ballymurphy, a Catholic young woman would open her curtains and bare her breasts. "The soldier's attention would be distracted and the Czechoslovakian sniper would shoot him dead." Other propaganda stories passed to the press by Wallace and Tugwell's office included claims that making explosives could give you cancer and that devices hidden in women's clothing might be ignited by friction from their underwear. But in the end it all spun out of control. IRD staff were removed from Northern Ireland in 1973 and their IPU colleagues soon after that. The aim of the exercise had been to defeat terrorism and save lives. Some now argue that all the spinning and lying may actually have had the opposite effect by making it harder than ever for both sides to understand each other.